The general and additional traffic restrictions for heavy goods vehicles are detailed in the booklet Heavy Goods Vehicles - Traffic restrictions published each year and available in different languages. 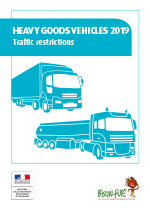 The schedule of special traffic bans for heavy goods vehicles also concerns the main roads network of the Île-de-France and Rhône-Alpes areas. Those traffic bans are detailed in the folder Heavy Goods Vehicles - Schedule of special traffic bans published each year and available in different languages (Spanish, French).